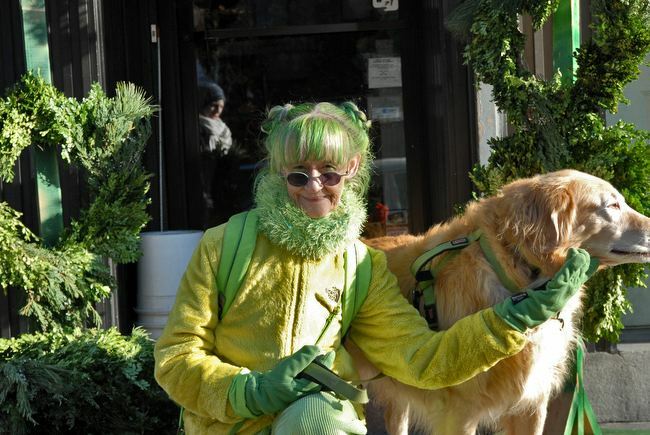 She goes by Sweetheart, but she is known as The Green Lady of Carroll Gardens. She wears the color green, often lime-tinted, sometimes with a yellow hue. Decked in overalls and feather boas and corduroy, her ensemble is like sunshine on grass. She’s worn all green, head to toe, every day, for 19 years. Locals occasionally glimpse her sprightly figure walking down the street, often with her dog, Dylan. There, and then gone. 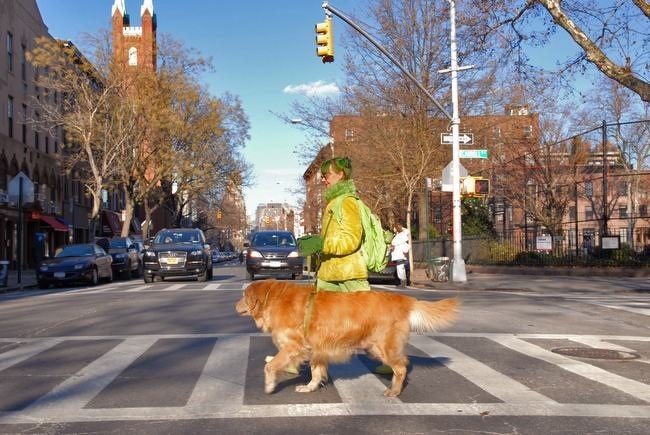 She is kind of famous – at least among Brooklyn children – who wonder if she is magic, and argue over whether or not her dog is also green, and whether or not she wakes up and goes to sleep green. “I’m addicted,” Sweetheart tells me, as we sit for a photo shoot in Nightingale 9 on Smith Street, after photographer Joshua Kristal and I devoured large bowls of Vietnamese-style Pho soup (mine, the pork, was infused with black pepper and roasted garlic and completely delicious). “I can’t even write on paper unless my pen has green ink,” she says, and then bursts into bubbling giggles – another trademark. She dies her underclothes green. It all started with green fingernail paint, she says, which spread till it encompassed her entirely. “I love it. It’s so positive. Dylan and I like making people happy,” Sweetheart says, that trademark twinkle in her eye. Sweetheart will turn 73 in March. She recently had a metal plate removed from her head – she had an aneurism years ago, but was allergic to the metal, and finally got it replaced. Despite her age and this recent medical situation, she exudes a timeless, whimsical spirit. The green has become an increasing passion, Sweetheart tells me. She buys green clothes and socks and shoes and accessories but she also stirs a pot of dye each day to stain her garments and hair. Today she is wearing what could be considered her standard attire: green overalls, a couple of green shirts, green socks and green shoes, a green coat, a green choker around her neck and a green backpack. In the mornings, Sweetheart pulls her hair into little buns before dying her strands with green highlights, and accents the do with green butterfly hair clips, with sparkly little green pins adorning her clothes. 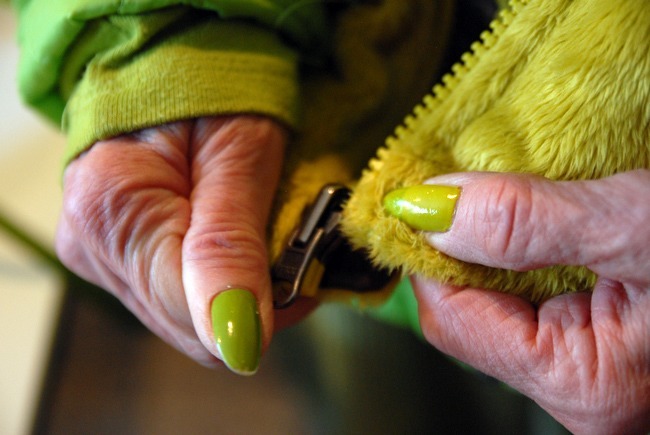 Her green nail polish is neat and tidy and shiny. Sweetheart is an artist, a graphic designer. She worked for Ralph Lauren for many years, and painted all of the little horses for the logos used on the clothing and scarves, she tells me. She painted many things, and designs fabric. At one point, she had a large staff of designers working for her, but she tired of the hustle-bustle and downsized, she says. Now, she works out of her home and sells a line of vintage prints. “I make just enough money to pay the bills,” she says, and seems quite content with that. Sweetheart moved with her husband to Nelson Street in Carroll Gardens 28 years ago. She has a son, Sam Eaton, a mentalist and magician who performs a one-man show, The Quantum Eye, every Saturday, on Saint Mark’s Place in Manhattan. The show has gotten rave reviews during its 8-year-run (info below if you’d like to buy tickets). 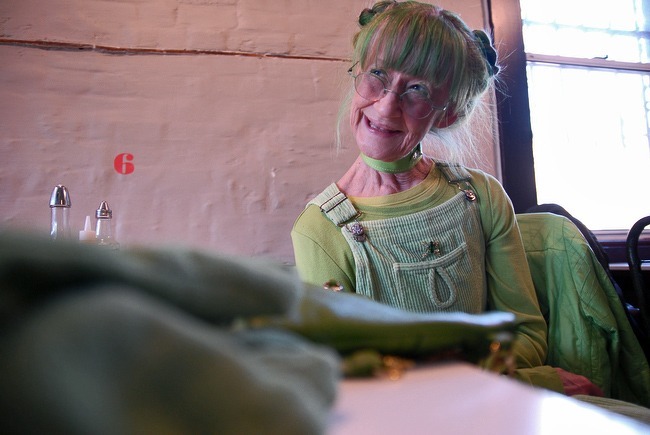 Sweetheart says she experimented for years before finding her comfort zone in green. For a while, she wore only 1930s print dresses. “I made hats to go with them,” she says. Then it was all silver for a while, and then pink, purple and blue, before she settled on green. I ask if she ever tires of green. Sweetheart grew up on the Bay of Fundy in Nova Scotia, on the east coast of Canada, above Maine, a very green place that is famous for its high cliffs and the fact that it experiences the largest tidal flow in the world, with more than 100 billion gallons of seawater crashing in and out of its coves every day. This Christmas, Sweetheart is back in New Brunswick, visiting her 103-year-old mother, who is soon to turn 104. “We look exactly alike,” Sweetheart says, though her mother does not dress in green. “Both of my parents were doctors. I’m so different than them. Dad was a surgeon and the best gardener in the province,” Sweetheart says. When Sweetheart was one week old, her dad went away to World War II. Her family grew most of their own food, eating vegetables from the garden, and her grandfather shot animals to eat. “My grandparents were people of the land,” she says. Her grandmother and she would sit on a rock and paint the sunset. “That’s what we would do. In 1964, Sweetheart hitchhiked to New York City. “I wanted to be an artist,” she says. She lived for 13 years on McDougal Street in the West Village, down the street from Bob Dylan. She named her dog after him. It’s actually her son’s dog, she says. Now Carroll Gardens is home. Sweetheart has a garden in her backyard, and grows long skinny eggplants with little purple flowers, and prolific tomatoes. I ask what motivates her to dress in green every day. “I airbrush his tail and his ears when my son isn’t looking,” Sweetheart says, before bursting into giggles. In parting, she flashes her smiling eyes, which really do twinkle. 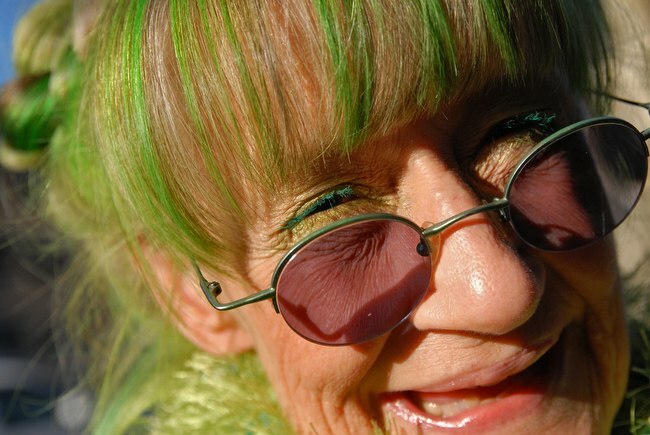 Despite my fascination with her grass-hued passion, it’s the smiling sparkle in her eye that stays with me the most. Beautiful article, Lisa! YOu managed to surprise a glimpse of a wonderful soul… Thank you & Merry Christmas!